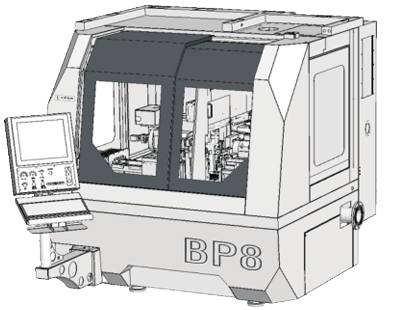 BP5/BP8 high precision CNC cylindrical forming grinder with 2 direct driven motor spindles. Machine mainly used for pre-work of tool blanks. Cylinderical grinding include point and steps with high precision runout through the V-Block supporting device. Roughing and finishing in one process reduce time and give you a high efficiency and tolerance stability during your automatic sequece. 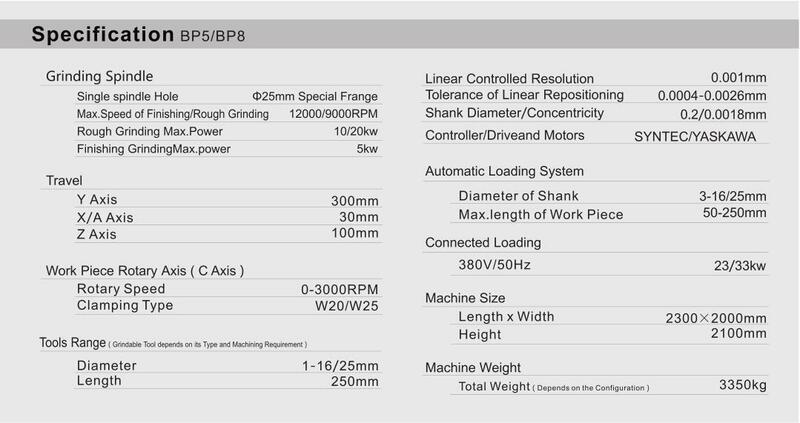 BP5/BP8 high precision CNC cylindrical forming grinder mainly grinds cylindrical form for carbide blanks below Dia. 25mm. Professional grinding wheel balancing technology is a mature technology to ensure concentricity of workpiece. The BP8 NC grinding software of Beiping machine tool can realize synchronous high speed and precision grinding of rough and fine grinding. Heidenhain scales can improve interpolation accuracy and ensure high precision. The machine can be optionally equipped with a 3 axis automatic loading system. Anti-collision system, accurate clamping and high accuracy holding for work piece.